We had to do something! When we moved back to Canada two years ago from Hong Kong I was eager to get involved with a church congregation in Winnipeg. My husband Dave thought we should shop around for a church. “Give it a year,” he said “and then we will decide.” There are more than a dozen churches that belong to our particular Mennonite church conference in Winnipeg and I think we went to them all, some several times. But we also attended Lutheran churches, United churches, Anglican churches and non-denominational congregations. And soon……. two years, not one had passed. When our two year anniversary of being back in Canada was reached I put my foot down. ”We have to decide,” I said. It ended up that last slip contained the name of a church we’d both written down. Neither of us got our top pick, but we were both content with the choice. I’m not saying the best way to choose a church is from a cereal bowl, but since our merry-go-round of visits and endless discussions about the matter had produced no results, for us at least it was a practical solution. Could I Have Been A Hutterite? There is Winnipeg Mennonite Fiction! He got it wrong! In March I took a course called Winnipeg Fact and Fiction from Roland Penner octogenarian story-teller extraordinaire. One class was about the contributions immigrant families have made to the city. Penner was right in asserting that immigrants and their children helped put Winnipeg on the map. Just look at people like …………. Politician Stanley Knowles who immigrated to Canada from Los Angeles with his parents in the early 1900s. Intrepid war hero William Stephenson, Winnipeg’s own James Bond, whose parents were immigrants from Iceland and Scotland. and comedian David Steinberg born in Winnipeg to Romanian immigrant parents. The purpose of the course Winnipeg Fact and Fiction was to introduce a topic about Winnipeg history and then suggest one or two companion novels that might shed an interesting perspective on that theme. Our teacher Roland Penner got it wrong when he recommended Fredelle Maynard’s book Raisins and Almonds as his top fiction pick reflecting the Winnipeg immigrant experience. Raisins and Almonds tells the story of a young girl growing up on the Canadian prairies as the child of Jewish immigrants from Russia. The first problem I have with Roland Penner choosing this book is that it’s not fiction, but Maynard’s memoirs. Secondly, although there are a some pages in the book devoted to life in Winnipeg the majority of the stories are set in the small Canadian prairie towns where Fredelle’s family moved in hopes of finding one where her father’s mercantile business would be successful. Someone in the class asked Roland if he could recommend fiction books that would represent the Mennonite immigrant experience in Winnipeg and he said there weren’t any. He claimed since Mennonites settled primarily in the rural areas of Manitoba, if there was any fiction about their immigrant experience it wouldn’t be set in Winnipeg. He was wrong. Dora Dueck’s novel This Hidden Thing, winner of last year’s McNally Robinison Book of the Year award, is definitely fiction and is set almost solely in Winnipeg. It tells the story of young Mennonite girls who came to live in Winnipeg to work as maids in the homes of wealthy people in order to help pay the money their families owed to the Canadian Pacific Railway. The CPR had financed loans to make it possible for Mennonites to come to Canada from Ukraine. Maria, the main character in Dueck’s novel, spends almost her entire life in Winnipeg after immigrating from Ukraine as a teenager. Penner is also wrong when he says there weren’t many Mennonite immigrants in Winnipeg. By the 1920’s six Mennonite churches had already been established in the city and by the 1950’s there were 7000 Mennonites living in Winnipeg. I’d like to find out if there are any other novels set primarily in Winnipeg that reflect the experience of Mennonite immigrants. The Grey Nuns are a Canadian order of Catholic sisters founded in 1738 in Montreal. Four women from this order came to Manitoba in 1844 to provide educational and medical services to the fledgling Red River Settlement, which would later become the city of Winnipeg. Could I have been one of them? I don’t think so. They were brave and courageous women, compassionate and daring, overcoming extreme hardship to carry out their divine mission of caring for those in need. On Sunday I was out for a walk and went by the St. Boniface Museum. I noticed it was open and decided to go in and pay a visit. St. Boniface is a French suburb of Winnipeg. The museum which tells the story of the Grey Nuns is located in their former convent, built in 1847. It is the oldest building in the city of Winnipeg. You might wonder why they were called Grey Nuns when their habits are clearly brown and black. Apparently originally the sisters did wear grey habits but their name comes from another association. The order was founded by this woman Marguerite d’Youville. She was a young widow. Her deceased husband, an abusive liar, who left his wife and two young children in debt when he died, had sold bootleg liquor for a living. Because of this, Marguerite and the three other women who helped start the order were called “les grises” – a phrase meaning both “the grey women” and “the drunken women”. The first description came from the color of their cloth habits, but the second, because Marguerite d’ Youville, the order’s founder, had been married to a man who sold illegal alcohol. Sisters Valade, Lagrave, Coutlee and Lafrance were the four nuns who volunteered to come to Manitoba from Montreal. They left on April 24 in a canoe and their trip was no picnic. In their journals they talk about walking through endless bush as they portaged from one body of water to another. They describe the snakes in their camps, which scared them so much they could hardly sleep. They had to climb steep hills and it rained almost everyday. Sister Emily Lafrance twisted her foot and the voyageurs who were paddling the canoes wanted to leave her behind. She soldiered on and walked with a limp the rest of her life. Sister Emily was very artistic. I took a photo of this paper mache’ Virgin Mary she made for the Grey Nuns’ first chapel. She also painted frescoes on the chapel ceiling and spun and wove beautiful altar cloths. The nuns traveled around to Indian and Metis settlements providing medical care and teaching the children. Metis are a cultural group in Manitoba. They are the children of First Nations women and French voyageur men. 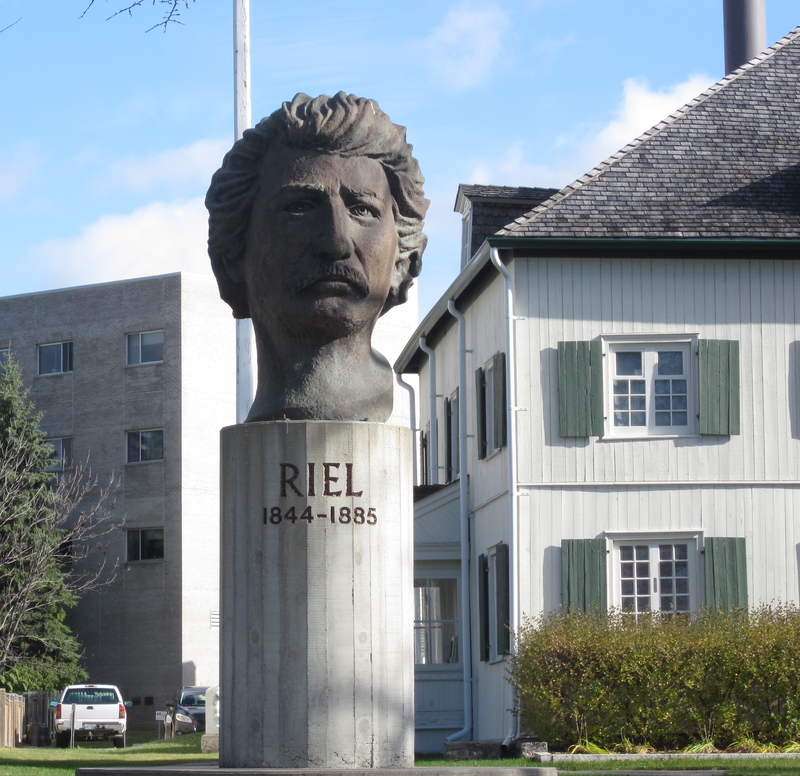 This statue of Louis Riel, Manitoba’s most famous Metis stands outside the Grey Nun’s convent. Many people say he was the founder of our province. Louis was one of the Grey Nuns’ students. When Sister Valade made a trip back to the order’s convent in Montreal she took Louis along and enrolled him in a college where he studied for seven years. Sister Teresa McDonnell was a Grey Nun who came to Manitoba in 1855 and won the hearts of the Metis, because her herbal remedies cured many of their illnesses. She traveled anywhere, in any kind of weather if someone needed her help. She was affectionately called ‘Sister Doctor’. In 1859 she was to go back east to the central convent but the Metis actually kidnapped her and kept her in Manitoba. 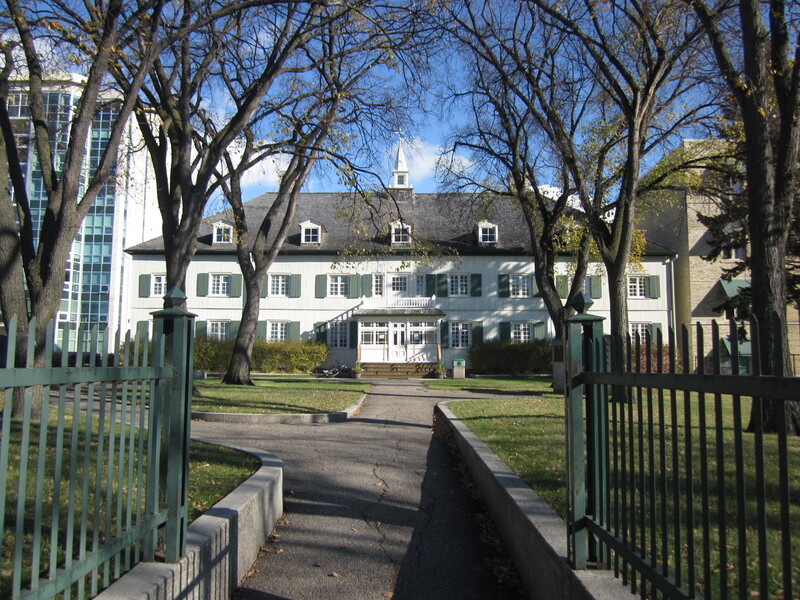 An article on the Manitoba Historical Society website says Sister Teresa was the founder of Winnipeg’s St. Boniface Hospital, and St. Mary’s Academy, a well-known girls’ school. I have several personal connections with the St. Boniface Hospital. I lived on the hospital campus for a year when I was six years old, because my father was a medical resident there. There was a special apartment building near the hospital for residents and their families. My sister Kaaren was the chief nursing officer at the St. Boniface Hospital from 1997-2007. Now I visit the hospital regularly because it is where my mother has received dialysis three mornings a week for the last four years. I asked the attendant at the museum if the Grey Nuns’ order was still active. She said there are a few Grey Nuns left but the youngest is 65. The government has taken over most of the hospitals and care homes that were founded by the Grey Nuns. There is a plan underway to bring in young nuns from an African order to carry on the Grey Nuns’ legacy. Apparently there just aren’t enough North American women willing to dedicate themselves to a nun’s life anymore. Could I have been a Grey Nun? I’m not sure I could have lived the isolated, selfless life they did, ignoring physical discomfort to bring hope, literacy and healing to so many people. I am glad however that I visited the St. Boniface Museum and learned all about the Grey Nuns and the important contribution they made to Winnipeg and the province of Manitoba.